Prosciutto wrapped figs make for a delectably dynamic duo in this flavorful classic. The delicious tang of the blue cheese is the perfect match for the sweetness of the figs. 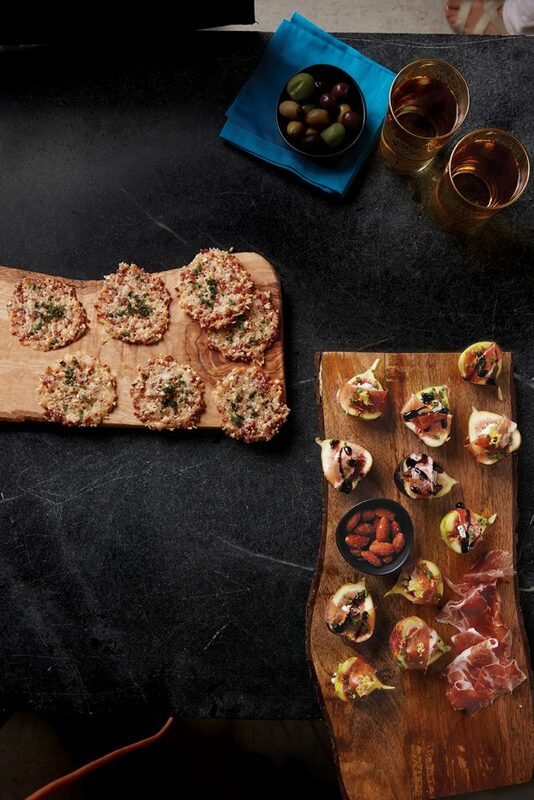 Wrapped in a savory blanket of prosciutto, this appetizer creates a delicious kaleidoscope of flavors in one small bite. Perfect for quick assembly before a gathering of friends and family or to bring along to a potluck, these prosciutto wrapped figs are a great accompaniment to a range of other dishes, including charcuterie boards. Bring these along with a bottle of Grenache to your next party and you’ll become the guest of honor. Recipe originally featured in Fine Cooking magazine. Stuff a cube of blue cheese into the center of each fig, then wrap with a strip of prosciutto. Arrange them on a board or platter and sprinkle with the chives. Top with pinch of lemon zest and/or drizzle with balsamic glaze, if desired. The figs can sit at room temperature for about two hours.